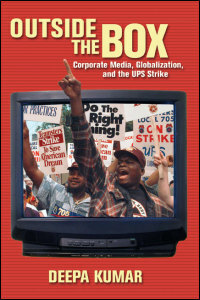 Outside the Box presents a rare, in-depth study of media representation of the 1997 United Parcel Service (UPS) workers’ strike. Deepa Kumar delineates the history of the strike, how it coincided with the rise of globalization, and how the mainstream media were pressured to incorporate pro-labor arguments that challenged the dominant logic of neoliberalism. Drawing on a textual analysis of over five hundred news reports, Kumar argues that media reform is more complicated than is suggested by liberal media theorists. She makes a case for a dialectical understanding, developing a “dominance/resistance model” for media analysis.